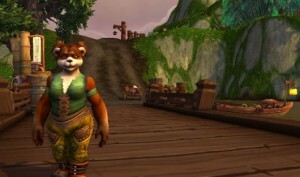 Various sneak-peaks of The Mists of Pandaria, the new expansion of the World of Warcraft on-line gaming universe, have begun to make their way around the Web. This new realm (actually new continent) was announced at Blizzcon (Blizzard Entertainment’s regular WOW convention) last October, and WOW-fans have been going crazy about it ever since — some positive, some negative, but all of them loud. This new expansion (the 4th) introduces new levels, a new fighting class (“Monk”), and as we noted a new continent known as Pandaria. Several new races are introduced in this expansion as well; some of them playable and some of them simply background or enemies. Chief among the playable ones are the Pandaren, a race of anthro pandas — based on both the giant (black & white) and red pandas of Earth. Of note for players of the game: Unlike most of the races introduced so far in the game, the Pandaren do not align themselves with either the Alliance or the Horde at the start of their adventures. Players develop the characters over several levels, and only at the end of that quest do they decide which traditional alignment they will take. Other anthro-type creatures in this new expansion include the Hozu, a monkey-like race, and the Mantids, who (of course) are insect-like. Much more about all of this can be found on Wikipedia. As of this writing the official release date for this new expansion is still shrouded in mystery (mists? ), but several leaked preview videos have been showing up on YouTube.